PLYMOUTH – At the start of the season, Livonia Stevenson coach Dave Mitchell stressed to his team that no team in the 43-year history of the program had ever won a state championship. Next fall, he can harp on his team to know what a repeat feels like as the Spartans topped Hartland 5-4 Saturday morning to take the MHSAA Division 2 state championship at Compuware Arena. “This whole season, we’ve been getting these guys to go and do everything they could,” said Mitchell. “We’re more than a family and I couldn’t be happier for the Stevenson administration and the alumni and the whole Livonia community. This was the first time a Stevenson team had the chance to play in a state final and we got it done. As for the game, nine goals, including six in the second period, made for dramatic flow. Travis Harvey made it 1-0 Stevenson off the draw at 4:55 of the first period on a set play from Michael Sinclair and Blake Battjes that beat Hartland goalie Nick Wineka low. Hartland then tied it at 6:26 when Austin Flores grabbed a loose puck in the slot and went top shelf over goalie Spartans’ goalie Connor Humitz. Just 54 seconds into the second, Chris McRae gave Hartland a 2-1 lead on an individual rush from center ice and a quick shot that beat Humitz low stick side. Stevenson came right back at the 4:30 mark. The Eagles were unable to clear their zone and LSHS captain Dominic Lutz found the puck on his stick and went upstairs on Wineka. Lutz tallied again at 7:07 to put the Spartans ahead 3-2. Harvey wheeled around two Hartland defenders, then deked Wineka down and out before backhanding the puck into an empty net at 9:10. Not to be outdone, Ned O’Boyle brought the Eagles to within one with an unassisted goal at 9:56 of the second frame. Ray Chartier whistled a shot past Wineka from just inside the blue line at 12:48 that Wineka appeared to see and get a piece of, but simply whiffed on it. Hartland came roaring out in the third and at the 14-second mark, McRae netted his second of the game by poking home a loose puck in the crease past Humitz. That would be the extent of the scoring as Stevenson held on for their first crown. Eagles’ coach Rick Gadwa, even in defeat, found a positive attitude after the game. This is a great story! Livonia has a rich tradition in hockey. It’s hard to believe that no Livonia high school has ever even made the finals, let alone with the championship. First time championships are something special. 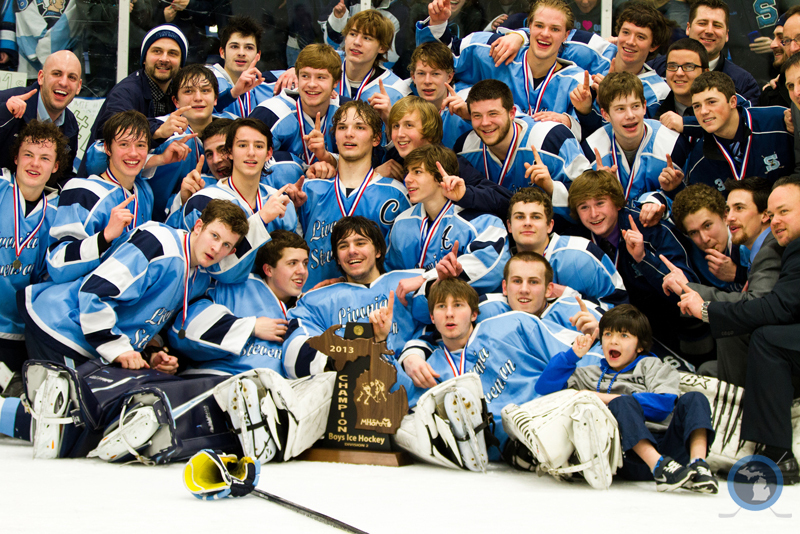 Congratulations to all the boys, school, and community, and congratulations to Brighton and Cranbrook as well.